Janasena Party Chief Pawan Kalyan cast his vote at the polling booth set up at Chaitanya School in Vijayawada. He allegedly broke the queue line to cast his vote. Personal security of the actor-turned-politician allegedly pushed those who were standing in the line to make a way for Pawan Kalyan. 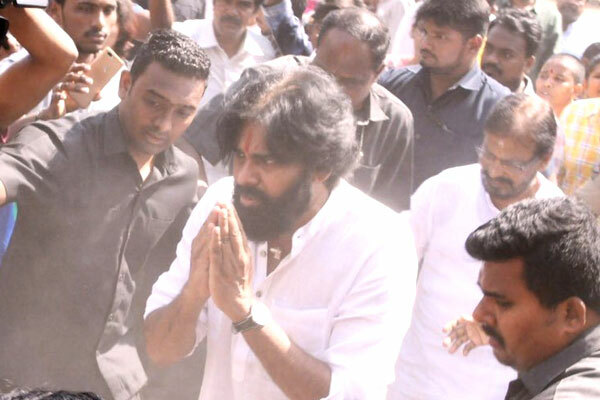 As per eyewitnesses there were huge crowd at the polling booth the moment Pawan Kalyan entered there. “Thousands of people gathered to watch Pavan Kalyan. Two police man can't control the crowd. When Pawan Kalyan was there, the entire media personnel and fans etc pushed each other which is a fact. The reason why he was allowed inside first so that it won't create more inconvenience to voters especially women,” informs a bystander. It may be recalled here that, Chiranjeevi was censured for trying to jump the voting queue during 2014 elections. He was forced to walk back and stand in queue. But, the situation is said to be completely different today.